It's winter. That's pretty much all that's going on now that the holidays are over. And so, blech, winter. But snow can be fun, I guess if you try really hard. Personally, I think snow is evil, but that's no reason not to do some snow-y crafts - ideas thanks to the awesome that is Pinterest. We've already tried a snowman pizza like this. I even took pictures, but then my dough went into super rise mode and it ended up being a very blobby/fluffy/crazy snowman, so you won't be seeing those pictures. The kids really liked eating it though, so that's what counts. 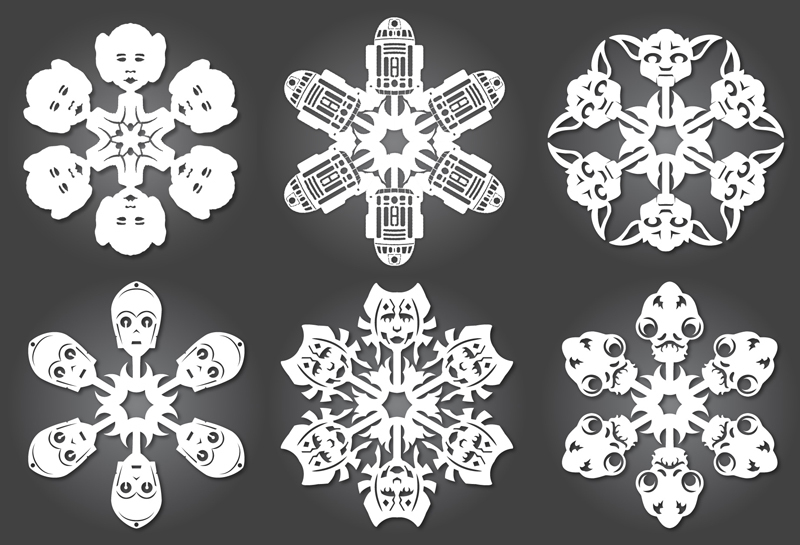 We're Star Wars geeks here, so these snowflake templates pretty much ROCK HARD. They're just awesome. And awesome. But I'm thinking they'll take some practice since precise cutting isn't exactly in my skill set. I've been wanting to make crystals with my kids for awhile now, how much more fun is a snowflake crystal going to be to make? These are made out of pipe cleaners and Borax, and only need to be left overnight to grow. So basically, win, win, win. And that's how I am going to cope with winter and snow. What about you?